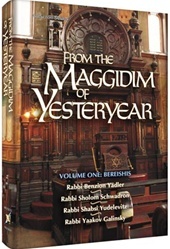 The maggid has always held a special place in the heart of Klal Yisrael. A master of words and stories, he traveled from city to town to village, a modern-day prophet who showed us our strengths and weaknesses, who made us laugh at ourselves while teaching us vital life lessons. In From the Maggidim of Yesteryear some of the best-known and most beloved maggidim of the past generations share their inspiration and wisdom. 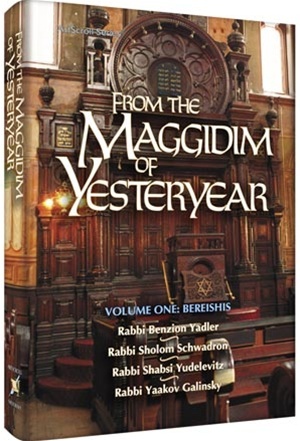 Following the order of the weekly Torah portion, here are stories and insights from the greatest of these itinerant teachers: the Maggid of Kelm, one of the most influential maggidim of Eastern Europe; Rav Shalom Schwadron, whose words galvanized all who heard him; the "Jerusalem Maggid," Rav Ben Zion Yadler; and the venerable Rav Yaakov Galinsky. These giants of the spirit offer us parables that bring our own life choices into sharp focus. They tell stories of great men and humble ones, each with a lesson that we can take into our daily lives.